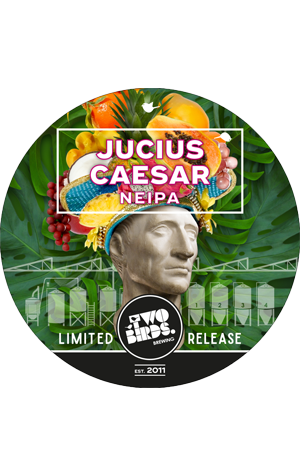 Two Birds make it a hattrick of IPAs in just three months as Jucius Caesar follows the glittery Stardust IPA and seasonal Autumn IPA in making its way out of the Nest in Spotswood. And, as the name suggests, it's an Italian IPA featuring noble hops. Only kidding, it's a juicy, hazy New England IPA. You know the score with such beers by now (at least, you bloody well should): heaps of hops chosen for their citrusy, tropical qualities, a full mouthfeel and little in the way of perceptible bitterness. For Two Birds, their "cornucopia of tropical fruits" was concocted via a combination of Mosaic, Citra, Nelson Sauvin and Ekuanot. They tell us it's a combo that "creates a party of rockmelon, pineapples and grapefruit so tasty that it'll have you dancing the samba!" If that sounds like your thing, you'll need to hunt it down on tap as it's a draught only release.